Base spirits like vodka, whiskey, and rum are the most common alcohols to infuse but traditional infusions can be done on any spirit with a high alcohol percentage. Using the sous vide or whipping siphon methods allows even high-sugar liqueurs or quick-to-fade wines to be safely infused. Once you move away from the milder spirits, the flavoring agents need to complement the base spirit being used. Infusing bourbon and dark rum can result in wonderful drinks but you should stick to stronger flavoring agents because subtle notes can get lost in the deeply flavored spirits. In traditional alcohol infusions, the proof of the liquor (the amount of alcohol present in it) affects the strength of the infusion. The higher the proof, the more flavor will be drawn out. Because of this, I tend to use overproof or 100+ proof spirits in traditional infusions. My favorite application of infused alcohol is for use as components in cocktails. 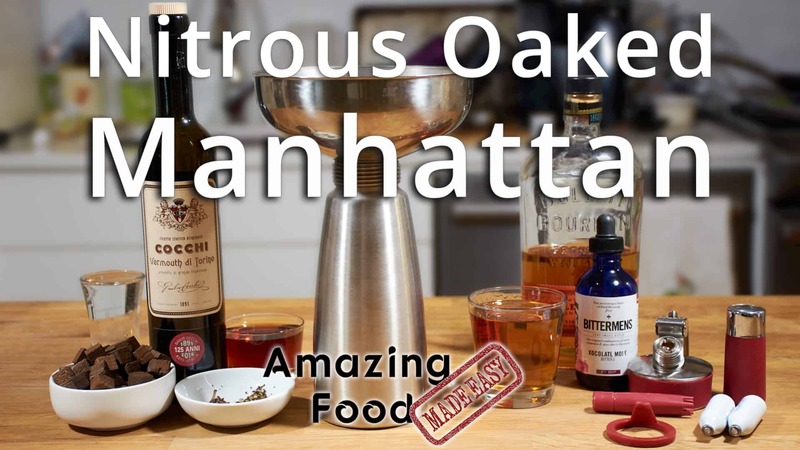 The flavors add great complexity in both alcohol-heavy drinks such as a Manhattan, Old Fashioned, or martini as well as lighter drinks like fizzes or sodas. Most alcohol infusions will last indefinitely in a dark cabinet, though the flavors will fade over time. You can get a good overview of all types of infusions by checking out my modernist techniques of Infusing Liquids and Foods. Get a more detailed look at infusions, including sous vide, whipping siphon, and traditional, as well as more than 140 recipes in my Infusions book.